“Proud” is not enough to describe how I felt as the National Museum of African American History and Culture presented “Shifting the Landscape: Black Architects and Planners, 1968 to Now,” in September 2018. The symposium focused on the activism, engagement, and impact of black architects and planners over the past fifty years. To share some part of that landmark occasion, I would like to share the stories of two pioneering African American architects — written by members of our curatorial staff, Tess Christiansen and Lindsey Bestebreurtje — those of Harold L. Williams and Norma Merrick Sklarek. Harold L. Williams (1924-2015) was a celebrated architect whose work focused on public service. His career helped physically shape the Southern California landscape and his work as a mentor and advocate continues to impact architects and his community today. Careful thought, good design and fresh ideas, multiplied by the strength of numbers and reinforced by the minority experience in this country can and will contribute to the solution of the problems confronting our environment. Our concern is that this contribution not be restricted by past and current barriers to equal participation in the mainstream of National life. Williams was committed to promoting community, both around Southern California and among African American architects. His firm, Harold Williams Associates, focused on buildings that served the public good, such as schools, civic centers, and city halls. He served on the Committee for Simon Rodia’s “Watts” Towers, a remarkable landmark of the Watts neighborhood. He also designed a new Watts Tower Art Center in 1967, to serve the community. Williams’ acclaimed design for the Compton City Hall and Civic Center, with a memorial to Dr. Rev. Martin Luther King, Jr. marked a new era, moving the city, and its changing demographics, into the future. Williams spearheaded a professional effort to increase diversity in the field by helping to found the Southern California Association of Minority Architects and Planners (MAP) in 1969 and the National Organization of Minority Architects (NOMA) in 1971. NOMA’s mission is to “champion diversity within the design professions by promoting the excellence, community engagement, and professional development of its members.” Williams sought to increase the mentorship opportunities and professional relationships among black architects at a time when so few were in the field. In addition to Williams, Norma Merrick Sklarek (1926-2012) also broke down barriers in the field. Her story illustrates the increased difficulty for African Americans women to gain a professional foothold. Sklarek was born in Harlem, New York. 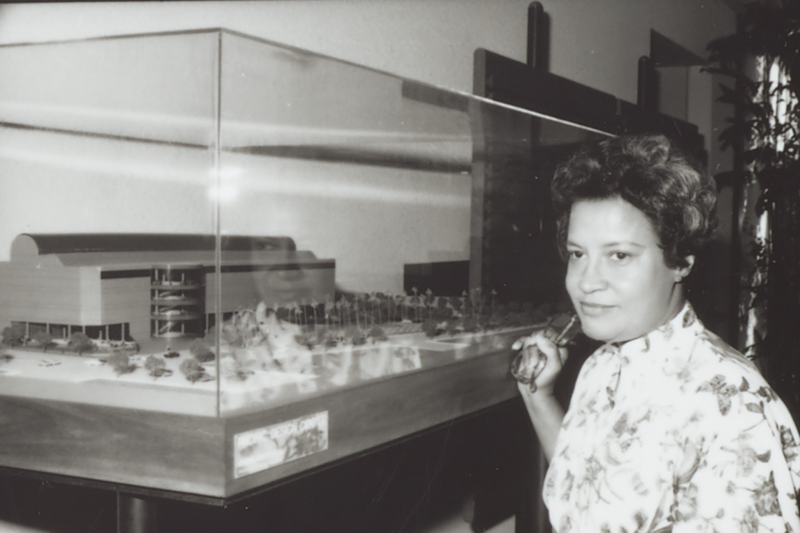 When Sklarek graduated from Columbia University’s School of Architecture, she was one of only two women in her class and one of the first African American women in the country to receive a license to practice architecture. Sklarek worked at numerous firms throughout her career including Gruen and Associates, where she became the firm’s first black female director. In 1985, she co-founded Siegel, Sklarek, and Diamond with Margot Siegel and Katherine Diamond. At the time, it was one of the largest women-owned architecture firms in the United States. Sklarek was the first African American woman elected to the Fellows of the American Institute of Architects (AIA), an honor awarded to only three percent of AIA members, which also includes Harold L. Williams. She received the AIA’s Whitney M. Young, Jr. Award for working to address social issues by promoting racial and gender diversity in the field. Through her social engagement, leadership and management skills, and design expertise, Sklarek helped expand and inspire the field of architecture. The careers of these architects demonstrate the strides made in the field of architecture. Through the creation of NOMA, professional and community activism, mentorship efforts, and renowned design, African American architects have helped shape the industry and inspired one another. The perseverance, ingenuity, and success of Harold L. Williams and Norma Merrick Sklarek should be lauded. However, given the adversity they have faced and the low number of African American architects today, there is much room for improvement. These distinguished architects laid the groundwork for future architects to build upon.